L.E.D. license plate bolt accent lights. Holds on your plate and lights it up too! 3/16" shaft. White LEDs. Cateye Tail Brake Light with clear lens on bottom for license plate. 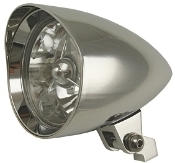 HDLT4-2-Headlight / Spotlight 4.5" Dia. HDLT4-5 Grooved Spotlight 4.5" Dia. 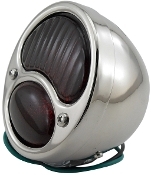 4.5" Chrome Steel Spotlight, H3 55 watt bulb. HDLTmisc-4-High Intensity Halogen Bulb Chrome Bullet Signal / Marker Lights -1.5" x 3"
High Intensity 55/100 Watt H4 12 volt Halogen Bulb replaces your 55/60 watt bulb for a much brighter high beam.